Determining the best 3D printing method for your next project can be a challenge. Take advantage of this new white paper from Xcentric Mold & Engineering and learn more about the pros and cons of each printing technology while defining their ideal uses and constraints. Technologies covered include Stereolithography (SLA), Fused Deposition Modeling (FDM), Selective Laser Sintering (SLS), Jetting, and ColorJet Printing (CJP). Learn to design better parts for 3D printing. 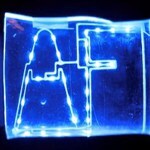 $10 microchip turns 2D ultrasound into 3D imager! What's so cool about ANSYS Discovery Live? Great Engineering: $10 chip turns 2D ultrasound machine into 3D imaging device! Technology that keeps track of how your smartphone is oriented can now give $50,000 ultrasound machines many of the 3D-imaging abilities of their $250,000 higher-technology counterparts -- for the cost of a $10 microchip. 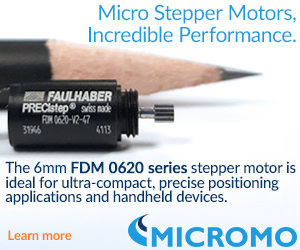 High-power motor for small spaces: FDM 0620. 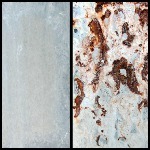 The standard practice to protect metal from corrosion for the last 70 years has been to apply a heavy coat of zinc. But a new product called InterCoat® ChemGuard, instead, reacts with the zinc to form a permanent, covalent bond on the surface of the metal. The product is applied over a light layer of zinc, which reacts with the zinc to dramatically improve its corrosion protection properties. The bond that is formed at the molecular level cannot be washed or worn off. A new technique called Hybrid 3D printing, developed by Air Force Research Laboratory researchers in collaboration with the Wyss Institute at Harvard University, uses additive manufacturing to integrate soft, conductive inks with material substrates to create stretchable electronic devices. Is Lamborghini coming out with an all-electric hypercar? Well, they're working on it, but they've got a lot of design and testing ground to cover before we see that day. To get the ball rolling, the Italian luxury sportscar maker has partnered with two labs at MIT to explore creating the super technologies that will go into their Terzo Millennio all-electric concept, including a vehicle that doesn't have a traditional battery energy storage system but does have a self-healing substructure. Who doesn't like a little flexibility these days? The L.S. 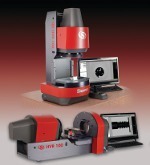 Starrett Company has just introduced the HVR100-FLIP, an innovative large field-of-vision (FOV) Benchtop Vision Measurement System that can be used in either a vertical or horizontal orientation and features a high-resolution digital video camera and minimal optical distortion for accurate FOV measurements of up to 90 mm (3.65 in.). 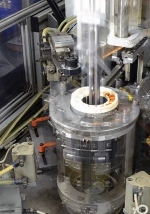 The changeable orientation lends itself to an extremely wide array of applications, from flat parts such as gaskets and seals to turned and threaded parts. Includes a 24-in. LCD touch-screen monitor, LED ring light, and motorized drive. Auto Part Recognition can be set to recognize and inspect a part in a few seconds. Can a little cobot arm take over the world? One industry after another, we've seen what UR cobots can do. 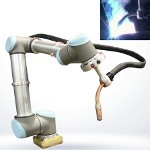 Now small job shops struggling with the budget, programming, and space requirements of traditional welding robots have an alternative solution: the new SnapWeld Collaborative Robot Welding package developed by ARC Specialties and Universal Robots. The system made its debut at FABTECH, along with some other new and impressive UR-compatible systems. How can Direct Drive servo technology help OEM engineers incorporate higher energy efficiency into machine design? This article by Kollmorgen Senior Applications/Systems Engineer Hurley Gill discusses how PMAC Direct Drive servo motor and drive technology not only reduces axis count, mechanical losses and noise, but also delivers increased efficiency and significantly lower cost of operation. Gill presents a determinate measure and a specific method for calculating optimal inertia ratio for managing energy utilization of a servo motor during a machine’s design to maximize power savings. LiDAR laser surveying tech is now available to the masses. 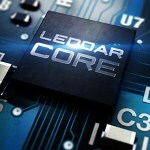 LeddarTech is the developer and owner of Leddar, a patented solid-state LiDAR sensing technology that constitutes a novel approach to light detection and ranging. Their product recently one two CES 2018 Innovation Awards in the categories of "Embedded Technologies" and "Vehicle Intelligence and Self-Driving." Up to now, this high-resolution 3D-mapping technology has been very expensive to incorporate into planes, autonomous cars, and drones. This advancement should help push forward large-scale production of automotive-grade LiDAR at an affordable price for mass-market vehicles. Learn more about this exciting technology. The Silicon Designs Model 1525 Series tactical-grade MEMS inertial accelerometer family is ideal for zero-to-medium frequency instrumentation applications that require high repeatability, low noise, and maximum stability, including tactical guidance systems, navigation and control systems (GN&C), AHRS, unmanned aerial vehicles (UAVs), unmanned ground vehicles (UGVs), remotely operated vehicles (ROVs), robotic controllers, flight control systems, and marine- and land-based navigation systems. They may also be used to support critical industrial test requirements, such as those common to agricultural, oil and gas drilling, photographic and meteorological drones, as well as seismic and inertial measurements. Motion and nanopositioning industry leader PI further expands its PIMag series of high-dynamics linear motor stages with a family of 18, the V-508 -- a new series of compact linear positioning stages with high-force 3-phase linear motors and crossed roller guides. 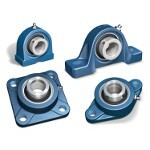 This line features high velocity, high duty cycle, and three travel ranges. A variety of incremental and absolute measuring linear encoders are available. PI’s ultra-precise linear motor stages are well-suited for industry and research. Applications include metrology, testing, positioning, scanning, precision automation, micro-assembly, biotechnology, delay-lines, laser beam control, optics, lens testing, and photonics alignment. 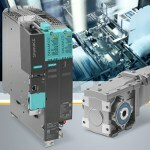 Siemens has expanded its extensive drive portfolio for servo applications to include the Simotics S-1FG1 servo geared motors, which are designed for use with the Sinamics S120 drive system. Sinamics S120 drives and Simotics S-1FG1 servo geared motors are an integral component of Siemens Totally Integrated Automation (TIA), which reduces engineering time and costs. The units have electronic rating plates, and the motors are connected via the Drive-Cliq system interface, so the system can be brought online quickly. The engineering of the Simotics S-1FG1 servo geared motor includes high efficiency and low torsional backlash for precise, dynamic motion sequences and is available in the following versions: helical, parallel shaft, bevel and helical worm gearboxes with up to 25 transmission ratios. Fine stainless steel MicroEtch Screens are manufactured by Tech-Etch using photo etching technology enabling hole sizes from .003 in. and up. Photo etching enables designers to specify a straight hole or a tapered hole, which facilitates liquid filtration and back-flow cleaning. Unlike stamping, photo etching yields a burr-free product resulting in cleaner, more efficient screens with greater material integrity. 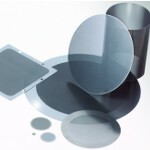 MicroEtch screens feature a tighter tolerance on hole sizes and greater dimensional stability than woven wire mesh, making them ideal in applications requiring frequent cleaning or in devices where there is mechanical contact. Researchers at Lawrence Livermore National Lab have made a major achievement in 3D printing one of the most common forms of marine-grade stainless steel (316L) that promises an unparalleled combination of high strength and high ductility for the ubiquitous alloy. Better yet, the new material outperformed samples made with the traditional approach. Military aircraft and airborne weapon systems may soon be able to guide themselves to targets on land or sea without using Global Positioning System (GPS) satellite signals, thanks to new, high-speed navigational technology developed by Northrop Grumman. Darren Garnick of Onshape says that, in a recent CAD satisfaction survey of 230 design professionals, Engineering.com asked a very provocative question: What do you hate most about your CAD software? The research, sponsored by SOLIDWORKS, revealed these four things that engineers and designers despise the most (in order of importance). 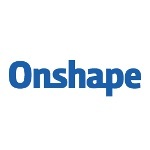 Read this informative Onshape blog. 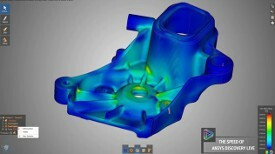 ANSYS Discovery Live provides instantaneous simulation, tightly coupled with direct geometry modeling, to enable interactive design exploration and rapid product innovation. With this interactive experience, you can manipulate geometry, materials, and physics -- and instantaneously see 3D results. Currently available for download as a technology preview, ANSYS Discovery Live fits into the 3D design family of products and is complementary to ANSYS SpaceClaim and ANSYS AIM. Learn about: Interactive Geometry, Interactive Physics, Interactive Results, and the Speed of Discovery Live. Engineers and scientists at the U.S. Department of Energy’s Argonne National Laboratory have invented a new foam, called Oleo Sponge, that not only easily absorbs oil from water, but is also reusable and can pull dispersed oil from the entire water column -- not just the surface. The material, based on common polyurethane foam with a few tweaks, offers enormous flexibility and can be adapted to other types of cleanup besides oil in seawater. The team is actively looking to commercialize the material. Click "Learn more" at the top right of the video to get even more details.